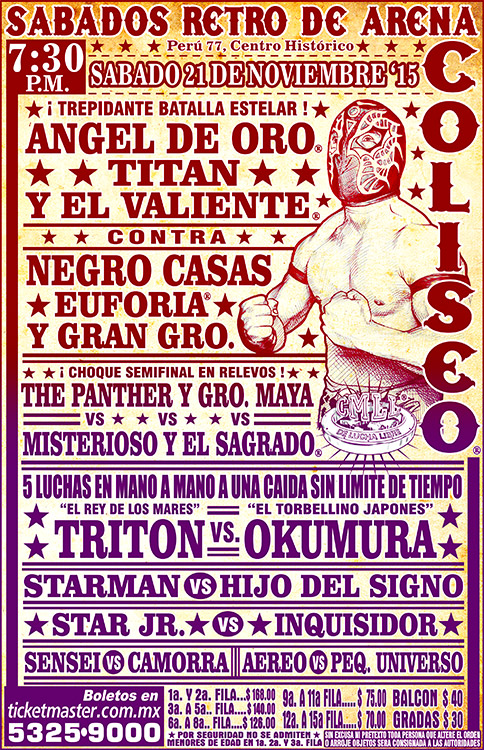 3) Ephesto, Hechicero, Luciferno b Guerrero Maya Jr., Rey Cometa, Stuka Jr.
Rudos took 2/3. Starting with this match, the losers were dragged off to hell. 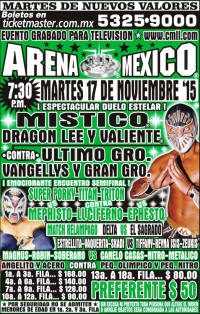 Gran Guerrero replaced Ultimo Guerrero on Monday. 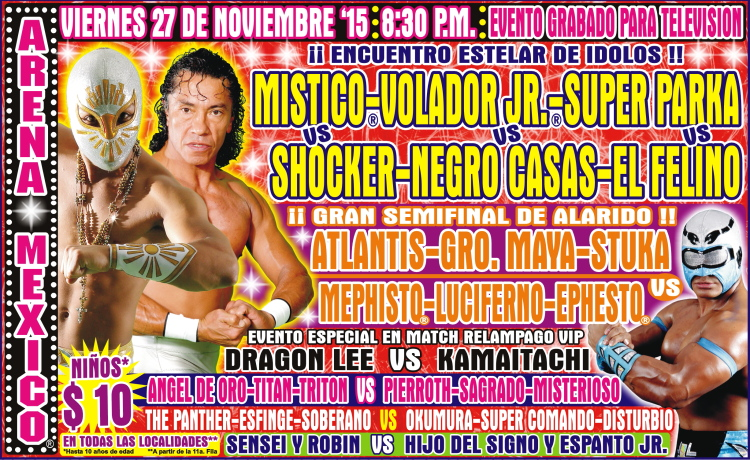 Cancerbero & Raziel were replaced by Arkangel & Nitro, which prevented a Magnus/Raziel rematch. 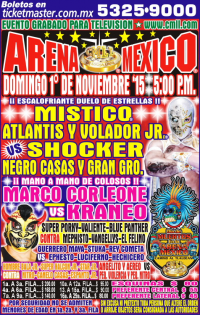 The Panther replaced Blue Panther Jr.
Hechicero replaced Shocker. Terrible appears to be stretchered out after the match, but it's unclear how he was hurt. 14:09. Tecnicos looked very good, took 1/3. 16:19. Tecnicos took 1/3 in a good match. Puma pulled Fuego's mask. 13:42. Tecnicas took 2/3. 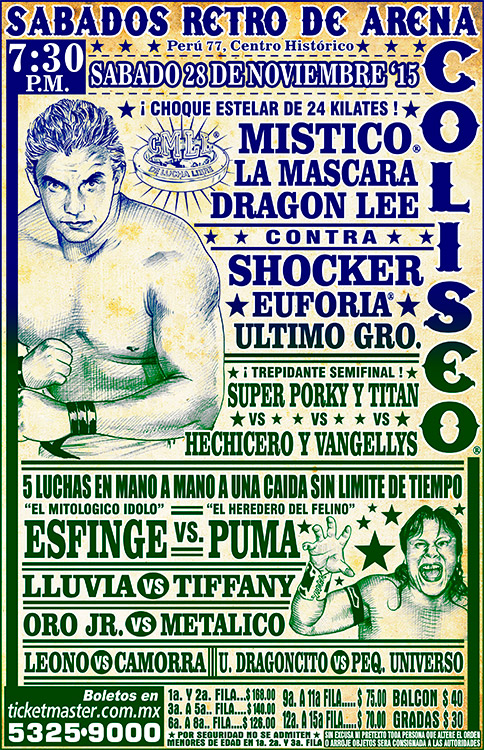 Syuri's return to CMLL; she and Silueta are REINA tag team champions and had the belts here. 13:42. Straight falls. Thunder was DQed for excessive violence in the first, the others were pinned in the second. 12:36. Tecnicos took 2/3. 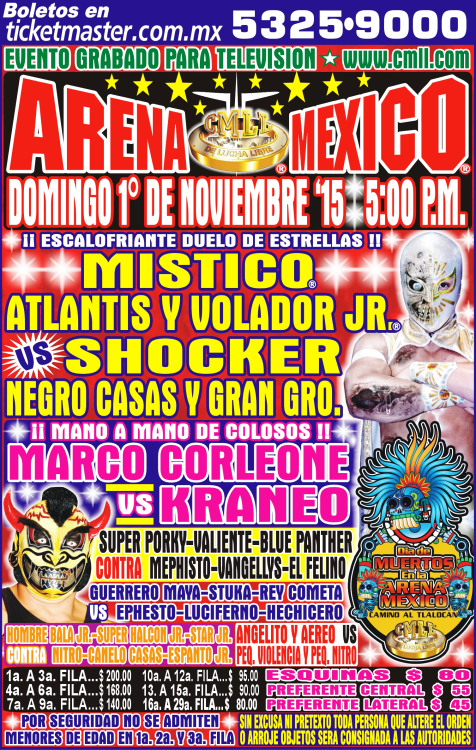 La Mascara switched places with Mistico on Thursday. 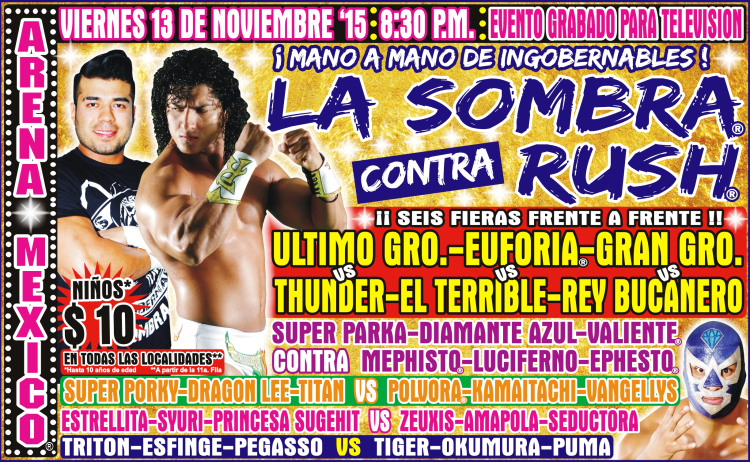 Diamante Azul's first match after another four month break in France. 10:44. Mistico switched places with La Mascara on Thursday. Team Mistico & Rush took falls 2/3. 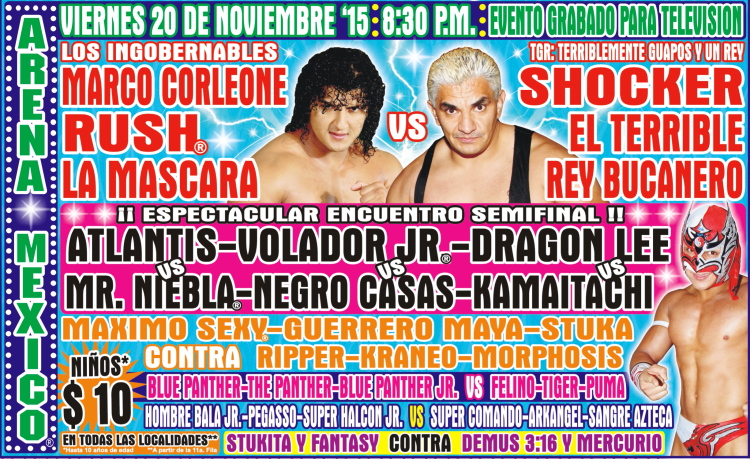 Volador & Sombra did not get along, while Rush & Mistico had no problem. 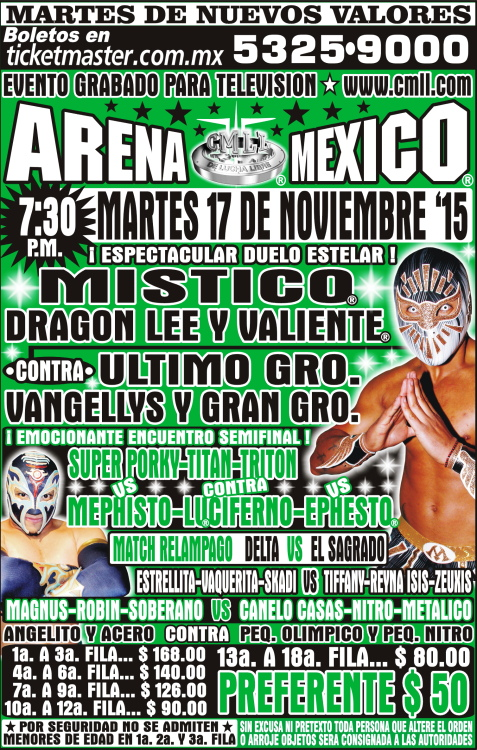 Volador was knocked down on the floor late and Sombra threw Mistico into the crowd. Rush & Sombra were left with no choice to fight. Rush tried to walk away, but Sombra cradled him from behind for two and it was on from there. Rush nearly got the corner dropkick and the referee nearly got taken once before being dropped moments later. Rush fouled Sombra, but the referee took a while to recover. When he did, Sombra did the same to Rush and that was called for the DQ. Volador carried Mistico back to the ramp, only to throw a drink in his face and chase him off. Sombra and Rush talked, both declaring how they were the best two luchadors and they should fight to see who's the best. They agreed next week, while also talking each other up and hugging at the end. 3) Okumura b Súper Halcón Jr.
straight falls, Mephisto fouling Porky. 16:57. Rudos took 2/3. Tiger pulled Triton's mask to reverse a pin and win. 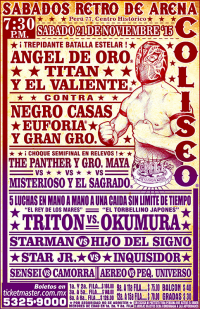 Rudos walked off with all the tecnico's masks. Seductora was originally listed, but was replaced by Isis during the week. Rudas took 2/3. Zeuxis beat Syuri with La Roca. They feuded, though not as much as last week. 11:18. Straight falls. Kamaitachi pulled Dragon Lee's mask as he dodged the top rope hanging double stomp for the DQ. 8:55. UG and Thunder continue to feud, with UG getting a sudden pin off a clothesline on Thunder for the win. 17:49. Rush took 2/3. Both men largely wrestled clean, though Sombra tried to cheat near the end. Fans did not support either man. Sombra escaped the corner driver by getting a hand on the ropes. Rush kicked out of the double knee smash, then reversals led to the Rush driver. Both mean talked about how great the other was and they left still as friends. 2) Canelo Casas, Metálico, Nitro b Magnus, Robin, Soberano Jr.
Sagrado used a Buca Storm to win in 7:50. 15:19. Rudos took 1/3, with Puma & The Panther feuding. 8:41. 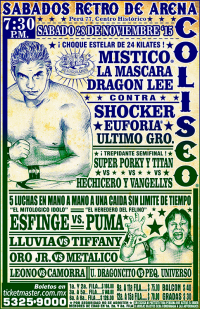 Tecnicos took 2/3, the last when Kamaitachi unmasked and fouled Dragon Lee. 3) Inquisidor b Star Jr.
Coliseo tag champs lose in non-title match, though it doesn't appear it's going anywhere. 2) Arkángel de la Muerte, Sangre Azteca, Skándalo b Hombre Bala Jr., Stigma, Súper Halcón Jr.
Valiente, actually wearing pants on this show, wants a title shot at Ultimo Guerrero. 8:41. Straight falls. Panther & Comando feuded, with Comando pulling off Panther's mask for the DQ. Panther demanded a mask match, Comando denied him and attacked him instead. Mascara didn't get along with his partners on this show.